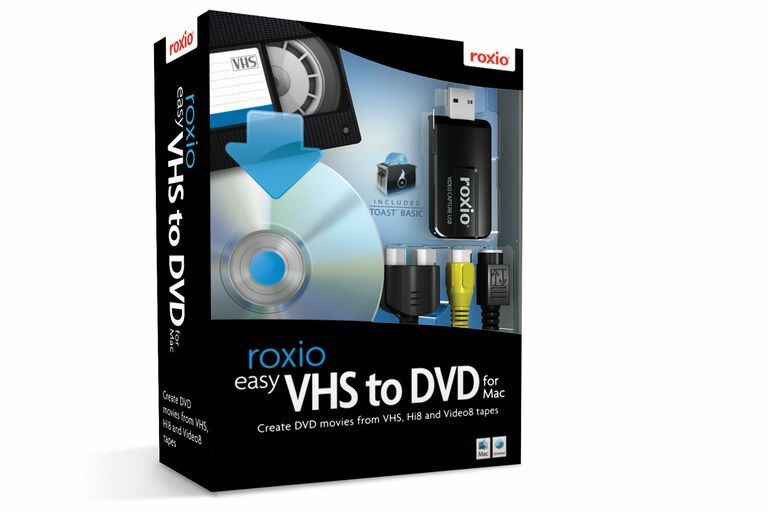 Roxio Easy VHS to DVD for Mac Review. Easy VHS to DVD for Mac marks Roxio’s entry into the video capture market for the Mac. Easy VHS to DVD for Mac is an analog, USB-based video capture device for turning your VHS, Hi8, and Video8 takes into DVDs. While Roxio’s focus is on transferring analog video tapes to DVDs, Easy VHS to DVD for Mac will work with just about any analog source, including cable boxes, camcorders, and other devices. Easy VHS to DVD for Mac works with older dual-processor G5 Macs as well as newer Intel Macs, making it a versatile choice for users of both generations of Macs. Easy VHS to DVD for Mac comes bundled with a USB 2.0-based audio and video converter. The USB is bus powered, so it doesn’t need an external power supply. A separate breakout cable provides plugs for connecting Composite video or S-Video, as well as two RCA jacks for grabbing analog stereo. (Easy VHS to DVD for Mac is strictly analog, with no digital inputs of any type.) Roxio also includes a USB extension cable, which allows you to move the video converter closer to your gear. Not included are any audio or video cables to connect the converter to your equipment; you will need to provide those cables yourself. The package includes two pieces of software. The first is Easy VHS to DVD for Mac, whose prime job is to capture the digitized video and audio stream from the USB device and convert it into a Mac-friendly file format. The other major function of the software is to convert the video into formats that can be used by QuickTime and iMovie. The other piece of software is Toast 9 Basic, which allows you to burn the saved video to a DVD. The DVD you create conforms to DVD standards and will play in any DVD player. Setting up and using Easy VHS to DVD for Mac is a piece of cake. Just drag the software to your Applications folder, plug the hardware into an available USB port, connect your analog source to the converter, and launch the application. You will probably spend more time untangling the cables behind your VHS recorder than you spend doing anything else; I know I did. Once you launch the Easy VHS to DVD for Mac application, you will be greeted with a pleasant interface that walks you through the process of setting up the application to record your video. Should you be a bit anxious and launch the application before you hook up the hardware, Easy VHS to DVD for Mac will admonish you and ask you to attach the hardware first. Launching Easy VHS to DVD for Mac application will drop you into a step-by-step process, with Roxio holding your hand the whole way. Begin by specifying a name for the recording. The name will be used as part of the file name for the captured video, and by Toast and other applications, so be a bit descriptive; a name like ‘Video1’ is not going to be too helpful down the road. You need to tell Easy VHS to DVD for Mac the length of the video you are capturing. This information is used to approximate the amount of storage that will be needed; it can also be used to automatically terminate the recording if you wish. Finally, specify the recording quality. Easy VHS to DVD for Mac lists two types of recordings. Standard recording uses a variable bit rate (VBR) to capture video at an average 4 Mbps. High recording extends the average VBR to 6 Mbps with a maximum capture rate of 8 Mbps. Both recording methods capture the video in MPEG-2 format, the same format used by DVDs. Next select the input source, either S-Video or Composite. Easy VHS to DVD for Mac shows a preview of what is being seen on the selected input, so you’re not likely to end up with a blank recording because you made the wrong selection. Next, you’ll be asked to confirm that audio is present. You should be able to hear the audio and see the audio on the audio meters. You can’t make any adjustments to sound levels; you can only confirm that audio is present. When you’re ready, press the big red ‘Start Recording’ button. You can also choose to automatically stop recording after the time you specified earlier. Once you finish recording the video, either by automatically stopping after a specified time or by manually stopping, Easy VHS to DVD for Mac will present you with options for working with the finished video file. Send to Toast: This option launches either Toast 9 Basic or the latest full version of Toast, if it's installed. Once it's open, Easy VHS to DVD for Mac will add the captured video to a new DVD-Project in Toast. You can then use Toast's tools to burn a DVD copy of your video. Edit with iMovie: iMovie is launched (iMovie 8 or iMovie 09 must be installed), a new movie event is created, and the video you captured is added. Importing the video into iMovie converts it to AIC (Apple Intermediate Codec) format. This conversion can sometimes take a little while. Once you finish making any edits, you can send your completed movie to iTunes, a video-capable iPod, or other devices. Send to QuickTime Player: When this option is selected, the video will first be converted to MP4 format and stored in the same folder as your original video. The original MPEG-2 video is not affected, and will remain in your Movies/Easy VHS to DVD Capture folder. Conversion to MP4 can take a good deal of time. A two-hour tape I recorded took just under an hour to convert to MP4. This being Roxio’s first hardware/software combination product for the Mac, there were bound to be a few rough edges. But the core product is a solid solution for the intended market and purpose, namely copying analog videos to a Mac for conversion to DVD and other digital formats. A simple USB device that captures analog audio and video into MPEG-2, the native DVD format. There are other video converters available, but most of them save the video file in a different format, requiring you to go through hoops to convert or encode your videos for storage on DVDs. Inclusion of Toast 9 Basic. After all, this product is designed to archive all of your analog movies to DVD format. Toast is by far the best DVD authoring tool for consumers and prosumers on the Mac. Simple setup and preview ensure the hardware is set up and working before you press the ‘Record’ button. It’s a basic idea, but it’s funny how often the basics are overlooked. Video Quality selection lets you decide whether size or quality is most important. Simple one-click sending of captured video to iMovie, Toast, or QuickTime. Roxio’s Easy VHS to DVD for Mac has a few rough edges. None are enough to be deal breakers, but it would be nice to see some improvements. You have to go through the step-by-step setup each time you use Easy VHS to DVD for Mac. After the first time or two, it gets a bit old. Custom time input. If you know the video I am recording is 38 minutes, you should be able to enter that time, and not be forced to either select the next highest time (one hour) and record 22 minutes of nothing, or have to wait around to manually stop the recording. Easy VHS to DVD for Mac should have its own basic editor. This is important so you don’t have to go through re-encoding processes that take lots of time and can degrade the final version. No converted video library management. If you record a movie and forget to ‘Send to iMovie’ or ‘Send to QuickTime,’ you're stuck. You can’t launch the application and load an existing converted movie. Sure, the MPEG-2 file is in my Movies folder, but as far as Easy VHS to DVD for Mac is concerned, it doesn’t exist. You're left to look for a third-party application to do what Easy VHS to DVD for Mac should be able to do on its own. Easy VHS to DVD for Mac is a very easy to use converter that can transfer your analog VHS, Hi8, and other tape formats into native DVD format, ready to store permanently on a DVD disk. Easy VHS to DVD for Mac includes a basic version of Toast, so creating a DVD from your videos is a simple drag-and-drop process. Roxio’s Easy VHS to DVD for Mac rates three stars because it does everything it says it will, and does so in an easy and intuitive way.